Tannaya Hantelman has scraped her way into the predominantly male world of mixed martial arts and ultimate fighting. Tannaya Hantelman is a rare breed. Just ask her how many women are like her in Atlantic Canada. "Doing what I do?" she says, laughing and playing with the hair elastic around her wrist. "Just me." At 6:30am, while you were probably just getting up, she was in spin class. Then, while you were having breakfast, she was lifting weights. And she will spend two hours this afternoon repeatedly being kicked and punched. For almost 30 hours a week, Hantelman punishes her body. She has to. 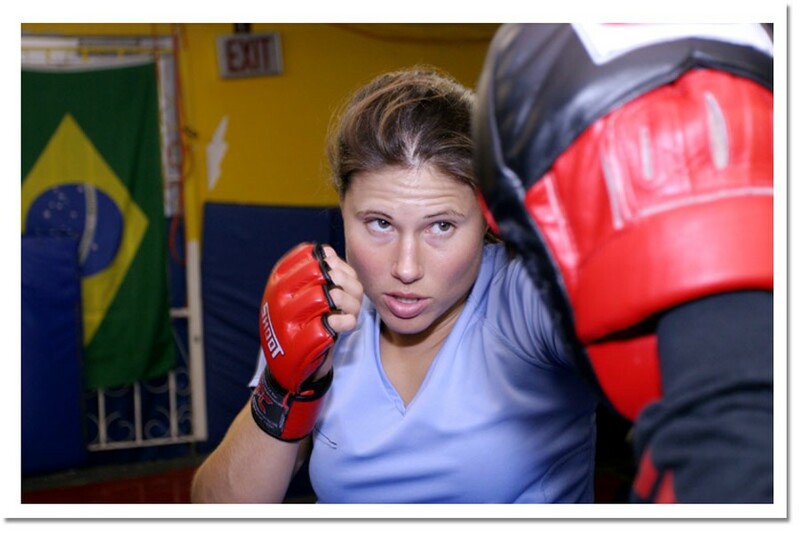 As the first and only female competitive mixed martial arts fighter in Atlantic Canada, she has a lot to prove. Hantelman. "I know lots of girls who kick-box and think MMA's cool and want to do it, but not everyone wants to get hit. Not everyone wants to get hurt. Not that I want to get hurt, but I'm OK with it." A long-time competitive Muay Thai kick-boxer, 25-year-old Hantelman got into MMA when she moved to Halifax from Winnipeg two summers ago. At Titans Gym in Fairview, she became interested in jujitsu. It wasn't long before she started to combine the two activities and become an MMA fighter. "I've done kick-boxing for five years. I'm just not afraid," she says. "It's just that little bit extra." Female MMA is still taboo. For Hantelman's first fight, promoters had to go to Quebec to find an opponent. And MMA's largest organization, Ultimate Fighting Championship, doesn't accept female fighters. This Friday at the Halifax Forum, Hantelman will show off her hard work in the ring against Alexis Davis from Port Colborne, Ontario. It's her second MMA fight and only the second time she's fought against another woman. Since she's the only female MMA fighter at Titans she trains with the men—including light heavyweight champion Roger Hollett. At today's class, Hollett is landing kick after kick over Hantelman's hands and direct to her head. "I'm 210lbs," says trainer Peter Martell, who also spars with Hantelman. "Sometimes when I land an easy punch, you don't realize that when you outweigh her by 80lbs...an easy punch is still pretty hard for her. But she's game. She doesn't mind." Martell knew early on that Hantelman had the drive, desire and athletic ability to become an ultimate fighter. "She's a tough kid...they can't go easy on her...they can't take her lightly." career came last March, when she stepped into the ring for the first time. She remembers waiting for her match in the changing room, trying not to cry as she watched the other fighters come back from the ring hurt and bloodied. "It was crazy. There's nothing I can say to explain it. It was overwhelming," she says. "You're just full of emotions—well, I know I was. I was light-headed. I was noxious. I was dizzy. But it was such an adrenaline rush. I don't think I'll ever feel that again." She didn't win the fight, but she did learn a lot and is looking to do better this time around. After her fight all her friends were there to congratulate her. "They're so supportive. A lot of them think it's really cool. They can't wait for the next fight." Hantelman, who works as a personal trainer, has also introduced MMA training to her clients, whose ages range from 21 to 61 years old. They also don't mind when she shows up sporting a fat lip or a bruised black eye. "It's not as though my dream is to be a famous ultimate fighter. I just train and it's just something, for me, that just comes naturally," she says. "You get black eyes, you get cut, you get bruises, you have sore muscles, but you fight through it and just keep training."